This oblong white English linen tea tray cloth is an exceptional example of a beautifully handmade and lovely quality vintage tea party linen. Brightly coloured flowers and foliage are arranged in the bottom right hand corner and would frame a little tea setting on a tea tray, cake or flower arrangement wonderfully. 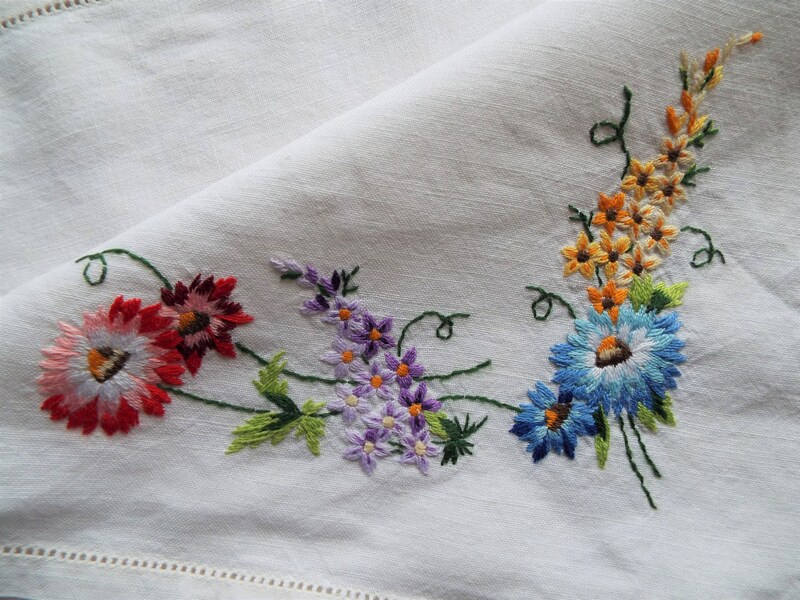 The design and colours are so very pretty and the stitches very tiny and neat, skilled and fine - photo 8 shows the reverse of the cloth and how neat these stitches are on the reverse, always the sign of skilled hand embroidery. The linen is a good quality, this tray cloth just looks and feels a special vintage teatime linen, perfect for a special tea time for two or for display. Perfect for a little tea table setting, this cloth would also work wonderfully as a vintage home accent piece and would display beautifully on a side board or consort table. It could even be turned into the front of a very precisely and pretty handmade cushion. This cloth would also make a wonderful gift to a tea time fan or lover of vintage linens. Made in England from linen, it most likely dates from the early 1950s. Please ensure you check the dimensions below before ordering. Excellent vintage condition with no snagging, thinning or tears. No marks as far as I can see. Any other wear or minor blemishes commensurate with age. Please just ask for further photos. Your cloth will be carefully and beautifully wrapped FOR FREEE in vintage style gift wrapping, with vintage style brown paper and ribbon. I will always combine postage where possible and cost effective if you are buying multiple items. I will then refund any postage overcharge, should one arise. Just ask if you like a shipping quote BEFORE ordering multiple items. Please read my shipping policies before ordering. Any questions just ask and thank you for visiting my shop! Vintage Linen Rectangular Tablecloth. Large Oblong Tablecloth with Hand Embroidered Pink Roses. Perfect For An Afternoon Tea Party! Vintage Linen Square Tablecloth. Hand Embroidered White Linen Tablecloth With Orange Embroidery And Threadwork. Perfect for a tea party!